This highly attractive poison bait will bring a swift end to these ants. Two weeks ago with the return of warmer weather, we visited stink bugs on the move as they exited homes in droves. Unfortunately, when Mother Nature turns up the heat other, cold-blooded insects resume their quest for food and shelter. My personal home invasion began on a warm day last week when legions of foraging worker ants laid down a trail from my patio door, along the baseboard, and up the wall to a drop of syrup on the kitchen counter. Odorous house ants have become a perennial guest at Bug of the Week as these small brown ants invade homes throughout our region each spring. Unwelcome ants receive a nasty surprise after establishing a colony in a surge protector. This ant earns its name by virtue of the distinctive smell it makes when crushed between your fingers or on a counter. The odor is reminiscent of slightly fermented coconuts. How and why does this invasion recur each year? After spending the chilly months of winter and early spring in a state of relative inactivity outdoors, with the return of warm weather, worker ants conduct an unending search for sugars, proteins, and fats to feed the burgeoning colony. In the wild, plants and other insects provide these foods. 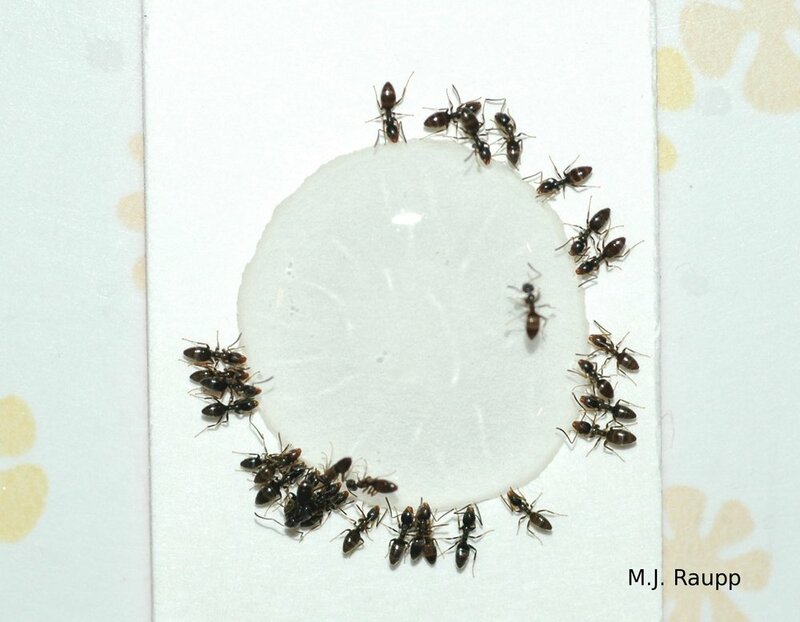 When ants locate a rich source of food, such as the sugary honeydew produced by a colony of aphids or scale insects, they establish a trail marked by chemicals called pheromones. The trail leads other workers from the nest to the bounty. Outdoors odorous house ants nest beneath stones or fallen logs. I usually have several colonies in my yard in a woodpile or under stones in a wall. However, odorous house ants are very opportunistic and will occasionally enter homes to set up shop. I have discovered colonies of these rascals in my wall voids and in electrical appliances including a surge protector beneath my desk. Their quest for food brings them into homes and a few grains of sugar on the counter, a pet dish on the floor, or a leaky bottle of pancake syrup in the pantry, will often initiate a full-scale invasion by searching workers. Odorous house ants regularly tend aphids outdoors. If you find ants and their telltale trails on counters or along baseboards, try to locate the source of food and then follow the trail back to the point of entry into your home. To foil these raiders, first eliminate as many sources of food as possible. Clean the counters, mop up drips, and get pet food off the floor after your pets have eaten. Be sure that no syrup or sweets are spilled or leaking in your cupboards. Ant trails on the counter or floor can be disrupted by spraying them with household cleansers. You can buy ant traps or purchase tubes of liquid or gelatin ant baits. Place ant traps or baits at locations indicated on the label. I usually place one near the point of entry to my home and several others around my counters and near their raiding columns. The traps and baits contain a lure that attracts ants searching for sweets or fatty foods. The lure contains poison. Workers ingest the toxin and are killed or in some cases they carry the toxic treat back to the colony and feed the deadly meal to the queens and their nest mates and, voilà, the royals are assassinated and the colony with them. A few well-placed bait stations in my kitchen put an end to the ant trails in a matter of days. To be effective, the bait must attract ants. If you purchase a bait or ant trap, and the ants eschew your invitation, well, get yourself another type of trap or bait. Whenever you use a product containing an insecticide, be sure to follow precisely the instructions on the label. Never apply pesticides directly to surfaces used for food preparation or consumption like countertops or tables. Many species of ants can become visitors or residents in our homes. Large black ants in the home, especially ones with wings, may be carpenter ants and a sign of more serious problems than just a little sugary larceny. If you have concerns or questions regarding the identity or management of any six-legged vandals, contact your local extension office for advice. To learn more about odorous house ants and other ants inside homes, please visit the following web sites.